Bottles can be used as many creative handycraft with some professional touches to create various types and functions. There are so many types of bottles that can be utilized such as fizzy drink bottle, cleaner bottles and glass bottles. Remember that , by utilizing the bottles we save enviroment of course. 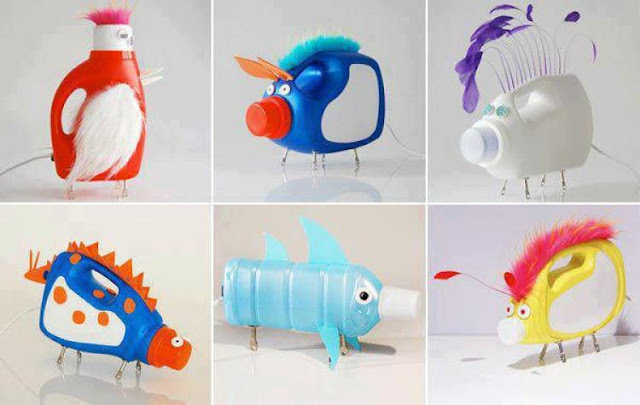 If you have plastic bottles, you can create unique handmade and has a sale value. It means your homemade craft is not for your own use but also being your home bussiness by selling these unique craft. You can create the bottles into hand-crafted dolls with a variety of uniques adn variety characters. Now you no longer need to buy expensive toys for your children at home. Just make these creations and with any character. This also being the media learning to your children make someting creative with your guide. Maks sure that the bottles is save for your children.